Prices vary based on size, breed, and condition of coat. *Severely matted dogs will be shaved or charged an additional de-matting fee of $15 per 20 minutes. Sarah is our fabulous groomer! 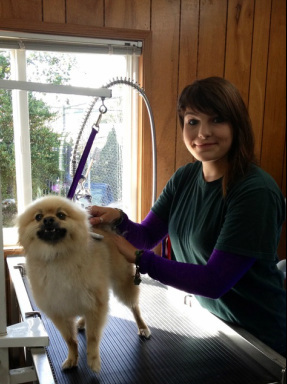 She is a Professional Pet Groomer certified at the Maser's Academy of Fine Grooming with over 1,000 hours of experience. She is certified in all popular breeds and specializes in doodle and schnauzer cuts. Sarah is amazingly patient and positive. She also practices low stress handling procedures in order to make grooming a good experience for every dog. We offer a Grooming Loyalty Card for all A La Carte services. Get 9 services of equal value and receive the 10th one free!